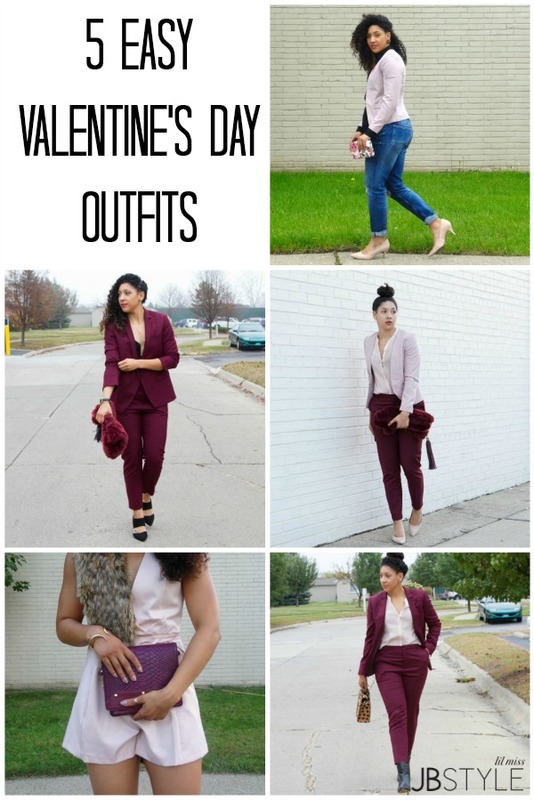 With my favorite holiday right around the corner I thought what better way to get into the spirit than to share 5 easy Valentine’s Day outfits for any occasion? Keep scrolling to check out how to put together the perfect look for your special occasion using what you already own! 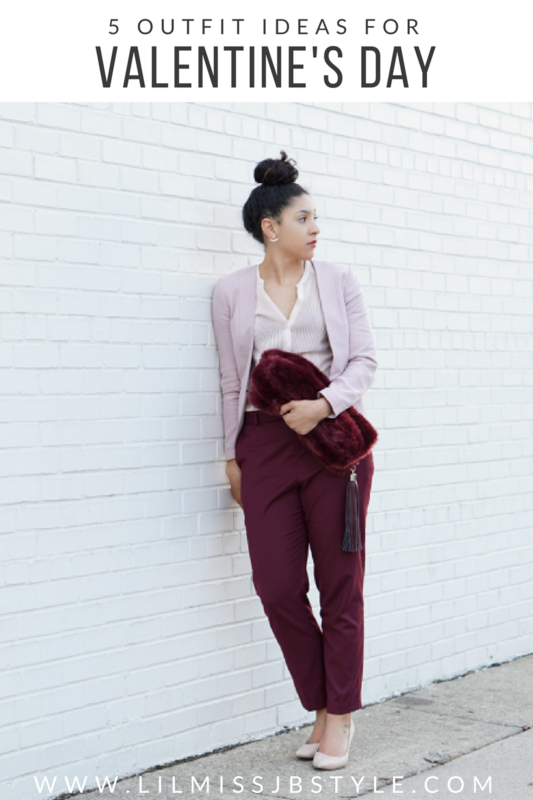 Pair a Valentine’s Day colored suit, or suit separates, with a body suit and faux fur clutch for the perfect feminine meets masculine look. 2. 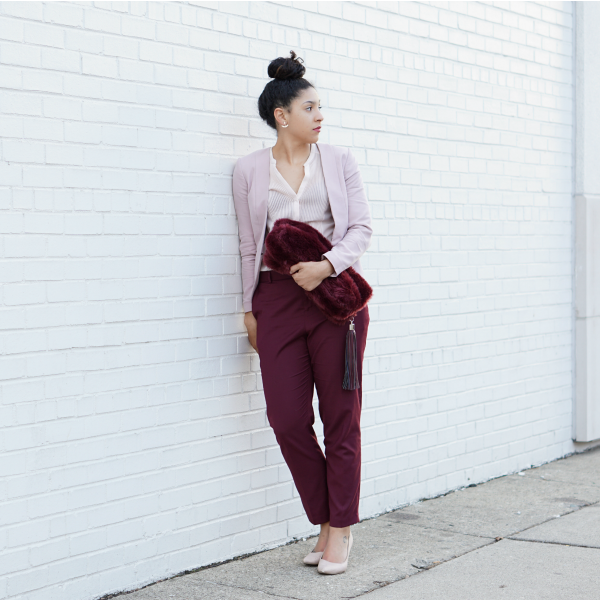 Color block blush and burgundy for a chic Valentine’s Day outfit. Be sure to place lighter colors where you want to draw attention to and darker colors where you want to minimize. 3. Go with a monochrome look and add some personality with your accessories. 4. Add just a touch of color with a blush or burgundy blazer and matching shoes to show some Valentine’s Day spirit without going over board. 5. Embrace your inner tomboy with a Valentine’s Day colored suit and edgy accessories. Destination. You want to be sure you look will work for the occasion so be sure to check out the dress code and pick clothes accordingly. Fit. Arguably the most important element of style, you need to be sure your outfit fits your body in a flattering way that makes you feel incredibly amazing! Comfort. Lastly be sure to pick clothes that you are comfortable in. Nothing is worse than seeing a girl do the baby deer walk in heels or constantly tugging at her clothing. Most importantly of all dress like yourself! Unless you’re going to a formal event that requires you to dress out of the ordinary stay true to your personal preferences and wear what makes you feel like a queen. Check out my YouTube Video for even more Valentine’s Day outfit ideas! Thanks for linking up t Top of the World Style. Gorgeous. 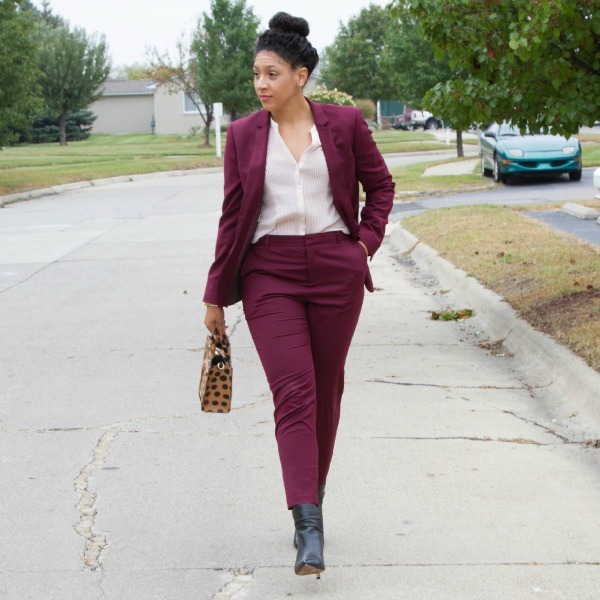 Love the berry suit! Thanks so much for sharing with Fun Fashion Friday & happy Valentine’s Day!